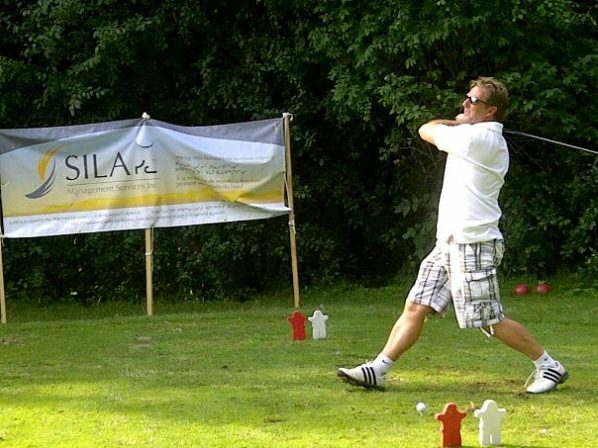 Habitat Supporter Terry Dobbin driving at SILA's Sponsored 7th Hole. Mr.Speaker, as we all know only too well, Nunavut continues to endure a housing shortage which seriously limits the range of housing options for Nunavummiut. Homeownership in particular remains sadly out of reach for the great majority of people in Nunavut. So when an organization like Habitat for Humanity decides to make a difference in a place like Iqaluit, we must support them in their endeavours. Mr. Speaker, Habitat for Humanity Iqaluit, the local affiliate for Habitat for Humanity Canada, is a community‐based, charitable, non‐profit organization committed to improving housing conditions for people who are gainfully employed and could maintain a home but are unable to afford the cost of financing a house in the North. This organization, Mr. Speaker, has invested itself in Iqaluit for the past seven years, counting two builds to date and another planned build in Apex starting in June. I am proud to announce Mr. Speaker, as was the case with the previous two builds, that the Nunavut Housing Corporation has donated a lot for the build in Apex as its contribution to this third project. The true strength of an organization such as Habitat for Humanity Iqaluit, Mr. Speaker, is its ability to unite many paths and many stakeholders to make the dream of homeownership a reality for those who would otherwise not get the opportunity. Igloo Building Supplies, First Air, Nunastar Properties, Canadrill, NCC, the Iqaluit Rotary Club, the Tower Group of Companies, RL Hanson Construction, MacKay Landau, Atiigo Media, Outcrop Nunavut, SILA Management Services and many more. Mr. Speaker, it is truly an honour to count the Nunavut Housing Corporation among Habitat for Humanity Iqaluit’s key partners. I look forward to continuing this tremendous partnership as Habitat for Humanity Iqaluit implements its recently approved strategic plan to build a further 8 homes by 2020.